One day your eyeliner turns out perfect on the first sweep, the next day….not so much. If you have a love-hate relationship with eyeliner (or simply don’t know where to start), you’re not the only one. Mastering your eyeliner technique can take some practice, but once you have it down, you’ll find you can use eyeliner to dramatically enhance your eye shape/colour and create the illusion of a fuller lash line. Va-va-voom! We’ve compiled the best eyeliner tricks of the trade, plus tips on how to find the right type for the look you’re after. Selecting your ideal eyeliner (powder, pencil, gel, cream or liquid) comes down to a variety of factors, including how intense or soft you want the look to be and how intricate of a design you’re going for. Use this guide to help you narrow down the choices and get application tips for each. Although pencil eyeliners are considered by many to be the easiest option to apply, they can also have more of a propensity to smudge and smear. Avoid “raccoon eyes” by opting for a pencil that isn’t overly creamy or slick, but also isn’t so stiff that it tugs at skin. Tip: To prolong wear, set pencil eyeliner with a similarly-coloured powder shadow to prevent smearing. Gel/cream eyeliners (the kind that come in a pot or jar) are a pro makeup artist favourite due to their rich, smooth application, long-lasting wear, and often dramatic colour payoff. They are also particularly great for anyone with oily eyelids or for use in humid climates because they're less prone to smearing. If you prefer a tight line, go with a flat, thin brush to distribute the eyeliner between lashes evenly. For a slight swoop at the outer corners, a bent liner brush with a narrow tip allows you to control the fluidity for precise application. For a dramatic cat-eye, a small angled brush will help you guide the shape of the line. The slanted design allows you to maneuver precise angles as well as thicker edges easily. Want one brush to do it all? Opt for a precise, narrow, point-style brush so you have the option of creating a thin line or building colour for a thicker line. Liquid eyeliner is the most dramatic but also tends to be the most difficult to apply. It takes a steady hand but offers a precise, defined line. Liquid liners that come with a thin, fine-point or felt-tip "inkwell" brush offer the most versatility in the ability to create a thick or thin line. Tip: If you want the intricacy of a liquid eyeliner for a cat-eye look, but your hand isn’t quite steady enough, use a combination of products. Place liquid eyeliner on the inner and outer corners of eyes, which is where you want the more precise detail, and use a gel or pencil liner in the areas where you want a thicker line. Using “cake liner” or powder eyeshadow along your lash line produces a softly blurred effect instead of the distinct line of colour that other types of eyeliner achieve. Apply wet for a more dramatic effect or dry for a softer look. Tip: You don’t need to buy a special eyeliner powder. Most any deeply pigmented powder eyeshadow works well in this regard. Picking an eyeliner shade is completely a personal choice and there’s no universal rule to it. Different colours complement different skin tones and eye colours and if you want to go a little wild with it, we say more power to you. Blue eyes can look stunning with a bronze eyeliner, green eyes pop with a purple-toned accent, and brown eyes can even rock a midnight blue. That said, the classics are always going to be flattering! If you want to use eyeliner to add depth to your lashes, making them appear thicker, opt for deeper shades of brown, gray, deep plum, or black. A good place to start when considering the thickness and intensity of your eyeliner is to keep it in proportion with the size of your eyelid. For a larger eyelid area, a thicker yet softer line of colour can be extremely flattering. For a smaller eyelid area, a thin, intense line of colour defines eyes in a beautiful way. For hooded eyes concentrate on lining the upper lash line with a very thin line that also goes in between the eyelashes (tight-lining) and follow up with a thicker mascara application to complement eyes. For drooping eyes, start with a thin line at the inner corner and gradually go thicker towards the outer edge, swooping the eyeliner up ever so slightly. This will help visually reshape the eye, creating the optical illusion of thicker lashes while drawing attention to the high point of your eyeliner. For any of these techniques, adding highlighter at the inner corners of eyes gives them a fresh, youthful look. There are hundreds of winged eyeliner tutorials out there because as simple as it seems, this look is harder to get right than you’d think. A trick we’ve found helpful? Use a tapered, fine point liquid eyeliner pen to draw your line (as skinny or as thick as you like) across the lash line, stopping just at the outer corner. Then place the point of your pen where you want the tip of your wing to be and angle it back to where you want it to connect with your eyeliner. Press firmly against skin to impart the colour and make sure it flows into your previously drawn line. Voila! If things get a little wonky, or you create a heavier wing than you like, use a Q-tip soaked in makeup remover to clean up your line. You can also use concealer to quickly correct smudges. 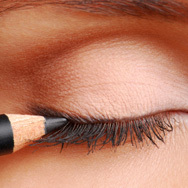 Some makeup artists suggest dotting eyeliner along the base lashes followed by connecting the dots; others prefer to use one fluid stroke, following the curvature of the eye and extending slightly past the outer corner. If you find yourself struggling with these methods, try anchoring your elbow on a countertop for balance and control. You can also smooth out a shaky line you've already drawn on by layering a black eyeshadow (or whichever colour matches your eyeliner) over it to help soften the rigidness and blur mistakes. Line only the outer two-thirds of the eye. Leaving a little unlined space along the inside corner of your eye gives a softer, less severe look. For a more dramatic look, you can line all the way across, but not everyone can pull this off, particularly if you have close-set eyes. Make sure that the eyeliner on the lower lash line connects with the back corner of the upper lash line. This creates a more natural, cohesive look. Apply a thin, soft line. Heavy liner on the lower lash line often ends up looking like your mascara has smeared. Less is more here. Whatever colour you used on your upper lash line, apply a softer variation here (perhaps using a shadow you own of the same tone).